The boyfriend of a reporter killed in an on-air shooting appeared at the Virginia station where both worked on Thursday, telling his co-workers and viewers that he wants to tell his girlfriend's story even as he grieves. Station anchor Chris Hurst dated reporter Alison Parker. She and cameraman Adam Ward were killed Wednesday during a live interview segment on WDBJ-TV's "Mornin'" show. Hurst appeared on that same show Thursday at the anchor desk to offer a remembrance. He recalled how Parker's voice could light up a room with its kindness and joy, and how excited she was about her work, including an upcoming piece on hospice care. He said: "Alison, what great things she could have done." In an interview with NBC News, Hurst described the nine "magical" months spent dating Parker, 24. He said he asked her out at the work Christmas party and they went on their first date on New Year's Day. "It's been magical ever since," according to Hurst. He and Parker celebrated "month-a-versaries" because they hadn't been together long enough to mark a full anniversary. For their sixth month, Parker gave him a photo scrapbook and asked him to fill the rest of the album with photos from their next six months together. The couple recently moved in together because they wanted to save up money for a house and get married. "It was a great month," he said. "Now I'm alone again." He said he is able to take strength from knowing he was "loved supremely" by his girlfriend. "If you are fortunate and work hard enough to be able to get a relationship like the one we had, if only for 9 months, then you have something to be proud of," he told NBC News. "That's what gives you strength right now, the day you find out that she is murdered." Hurst said Thursday he will take a brief break from his anchor role. "You won't be seeing me in my normal position for, who really knows how long. But hopefully not too long because Alison would want me back,'' he said. Morning anchor Kim McBroom told Hurst that he and Parker "were like Barbie and Ken — just the perfect couple." WDBJ started its 5 a.m. newscast with an image of the two victims with the words "In Memory." McBroom was joined on air by Steve Grant from sister station KYTV in Springfield, Missouri. While a few hugs were exchanged before the newscast, a dozen or so reporters and producers stayed focused on their work. The man accused of killing a television reporter and photographer during a live broadcast in Virginia on Wednesday had worked in the news industry on and off for two decades, including jobs in the Bay Area and Florida. Vester Flanagan, aka Bryce Williams, Flanagan grew up in Oakland, graduated from San Francisco State University and was an intern at a San Francisco television station. He interned at KPIX, too. 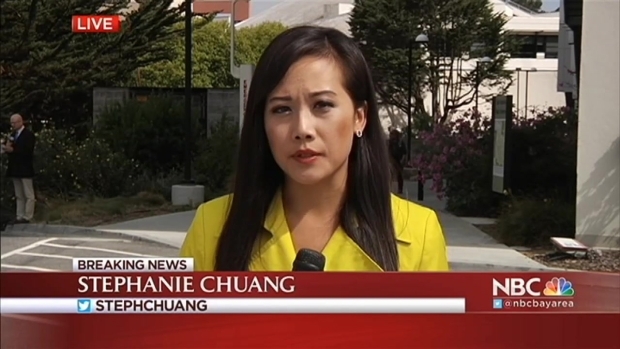 Bob Redell and Stephanie Chuang report. McBroom read a statement from Parker's father, Andy Parker: "Our vivacious, ambitious, smart, engaging, hilarious, beautiful and immensely talented Alison was taken from the world. This is senseless, and our family is crushed." Andy Parker on Wednesday vowed to make it harder for the mentally ill to get guns. "I'm going to do something, whatever it takes, to get gun legislation — to shame people, to shame legislators into doing something about closing loopholes and background checks and making sure crazy people don't get guns," he said in an interview on Fox News. At 6:45 a.m., the station observed a moment of silence on air at the time Parker and Ward were gunned down. Ward, 27, was engaged to Melissa Ott, a producer at the station who watched the incident unfold from the control room. The journalists were ambushed by former colleague, reporter Vester Flanagan, who shot himself during a police pursuit and died at a hospital. A man claiming to be Flanagan faxed a lengthy document to ABC News on Wednesday, sharing what the news network described as a long list of grievances. Hurst said on NBC's "Today" show Thursday, Flanagan "was obviously in a state of mind that was not reasonable or rational." According to the station's general manager, employees recognized Flanagan from video captured by Ward as he lay dying. The killer was looking into the lens and pointing his gun. "Everybody who was gathered around it said, 'That's Vester,'" Jeffrey Marks, told "Today". "And I wasn't sure. They were." He said the station immediately passed the information to the county sheriff, helping authorities identify Flanagan. The survivor of the shooting, Vicki Gardner, was in stable condition Thursday, her husband told "Today." Gardner is the executive director of the Smith Mountain Lake Chamber of Commerce, and was being interviewed live about local tourism when she was wounded. Her husband, Tim Gardner, said he was watching the interview live and immediately tried to call his wife on her cellphone when he heard the shots. "It was a pretty bad few minutes," he said.